I am pretty sure that San Diego (NKX) switched over to using the RRS Sippican sondes this summer. This evening's (00Z 1 October 2010) sounding is a classic bad RRS sounding, with numerous superadiabatic layers aloft. Shown above are skew-T plots from both Univ. of Wyoming and SPC. What a mess - eventually these serious instrument problems will get straightened out, but lots of bad data continuing to go into the upper-air archives! Several things of interest happening that will affect southeastern Arizona next few days and also next week. Out east in the Plains, high pressure dominates, extending from western Canada south across much of north and central Mexico. A re-inforcing push of cool, dry air today and tonight will be followed by a stronger push over the weekend and early next week, as a strong 500 mb trough digs toward the central Mississippi Valley. The top image shows the NAM forecast from this morning for 5 am Sunday morning, indicating that a strong backdoor front will have pushed into southern Arizona with gusty east winds. The easterly flow into Arizona will be quite dry, as the air over the Plains will be cool with low dewpoint temperatures - i.e., it's definitely a Fall regime. Later in the week a fairly strong 500 mb trough is forecast to dig into the Southwest, and this trough will have the potential to pick up some lower-latitude moisture, depending on where exactly it tracks, and how far north the old cutoff west of San Diego is kicked out. The bottom two images show the 168-hour forecasts at 500 mb from last evening's GFS and ECMWF runs (both are from the operational version forecasts). The eastern US cutoff low is very much stronger in the ECMWF, which results in a position further west for the cutoff in the Southwest. The ECMWF has a more moist trajectory for the Southwest cutoff than does the GFS, which tends to keep it on an over-land track. Thus, it will be interesting to watch to see which global model does best at mid-week next week. Note also that GFS has an Atlantic Tropical Storm in it's forecast. The large cutoff low at 500 mb that has developed off of southern California (see top water vapor image) has pulled more moist, low-level air into southwestern Arizona and southern California during the past 48-hours. Precipitable water amounts over southwestern Arizona range from around an inch at Tohono O'odham CC to an inch and a half out at Yuma. The San Diego sounding this morning (middle image) indicates some elevated CAPE (although PW is 6 mm too wet when compared to GPS observations). The radar data from Yuma this morning are detecting some rainshowers from around Ajo westward across extreme southern California. So, a bit of weather in the Southwest to keep an eye on. In the longer term the ECMWF is very aggressive in digging a strong trough into Arizona at 6 to 7 days - the ECMWF has been very much more accurate than the NWS GFS model in its predictions of digging troughs along the west coast the last several winters. There were a couple of very isolated, light showers in far southeast Arizona yesterday and 0ne scrawny Cb was visible to the southeast of Tucson at sunset. This morning, a backdoor front from the southern Plains has moved into southeast Arizona. Depoints remain around 50 to 60F right along the border. The morning (12Z Sunday September 26th) 500 mb analysis (top) shows that a well-defined, inverted trough is poised to brush westward across southern Arizona today and that 500 mb temperatures have cooled to around -8 to -9C in the deep easterly flow associated with this feature. The morning sounding at Tucson (middle) indicates little CAPE at low elevations. So, with the downslope winds and not much instability, expect at most some isolated buildups along the Borderlands. The most interesting thing I noticed in my morning look at the weather is indicated in the bottom chart - which is the 84-hour NAM forecast valid Wednesday afternoon at 5 PM MST. The model predicts a strong interaction beteen the 500 mb cutoff, currently over the central US and a tropical disturbance in the western Caribbean. This leads to a tropical storm, or a hybrid baroclinic/TS system, developing rapidly over the Florida Straits and moving north into southern Florida. Very nice morning with a cool low in the upper 50s here at house. The deep mT moisture has been pushed south again to around Guaymas. However, the model forecasts are interesting from Sunday afternoon through Tues-Wed next week. The NAM 500 mb forecast valid 5 pm Sunday afternoon is shown in top panel and the ECMWF four-panel forecast valid 5 pm Tuesday afternoon is shown at bottom. Both models have a substantial inverted trough/closed cyclone moving westward across western Mexico and brushing along the Borderlands. The models are basically dry, but it's hard not to speculate that such a pattern, if it materializes, will bring moisture and showers back north. The pattern is complicated by what would be a significant period of easterly winds with a backdoor front associated with the strong central US system - but, of course, all this too far out to worry about details yet. Cyrus Jones (Dept. of Atmospheric Sciences) has sent along time series from the Atmo weather station for the rain burst - produced by warm-rain, tropical-like showers over lunch hour on Wednesday, September 22nd. The intense rain rate is shown in the top series; the trace for T and Td is shown in middle; and the SLP trace is shown at bottom. The amounts along the track of the rain band, plus the short duration of the rains, indicates rain rates of 2.5 +/- approx. 0.25 inches/hour. There was brief pressure spike with the event, and winds were gusting over 40 mph at the roof-top anemometer. This was a quite interesting and most unusual event for here. First - NHC kept providing a very strange forecast for Georgette late into the day and early night yesterday - the top image is what one found at NHC at 6 pm last evening. They seemed to ignore the strong trough that was sweeping through the Southwest. 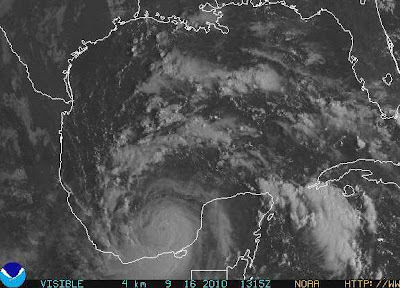 The trough quickly sucked up the remnants of Georgette and related heavy rains are now off to the east in New Mexico and Texas Panhandle. The advertised rain event for Arizona didn't live up to the model forecasts across most of the state yesterday. 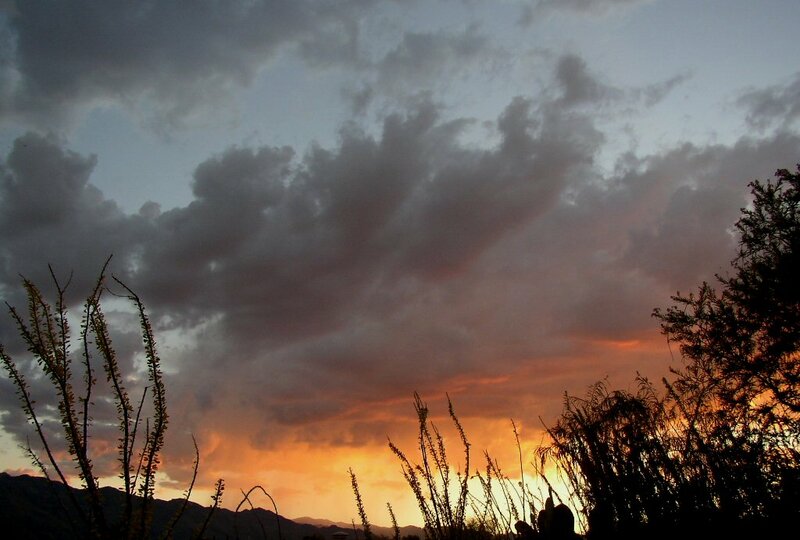 Tucson and DM had no rain last 24-hours, although POPs were 70 to 90%. Across the ALERT network only 37 stations (40%) had measurable rain. Four gauges had more than half an inch with Mt. Lemmon hitting 1.18 inches. Thus, all of us forecasters were done in to some degree by the models - we got the extensive intrusion of tropical moisture and strong southerly winds but not nearly as much rainfall as predicted - so, just when you think the models are really great - zap! However, on the small scale things got very interesting at lunch hour yesterday. 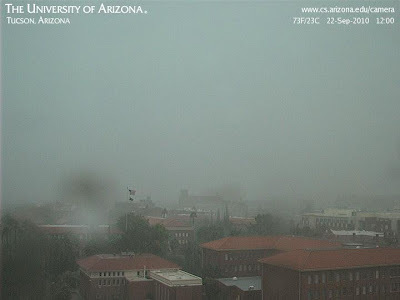 The middle photo shows heavy rain on campus at noon. The bottom radar image shows two small bands of moderate echo over northwest Tucson at 1220. These showers moved quickly up across Mt. Lemmon and were long gone by 1 pm. The atmo rain gauge caught 0.62" during lunch break. Here at the house light sprinkles began at noon and 20 minutes later there was 0.77" in the gauge - quite a rain rate! The heavy rain here was characterized by millions of small to moderate sized drops, no lightning, and no thunder. Thus, this seems to have been a typical, tropical heavy-rain band with warm-rain cloud processes predominating. I was very impressed - but, I wasn't caught out in it as were many at the university. The IR image (top) shows that Georgette is over the south-central GoC this morning and that a large plume of cloudiness extends northward into southwestern Colorado. The morning sounding from Tucson (middle) indicates deep moisture and mostly southerly flow. The sounding has more than an inch and three quarters of precipitable water, but very slight CAPE. Thus, unless we would get some heating (which doesn't appear likely until drier air sweeps in from west), rainfall at low elevations will be dependent mostly upon vertical motion ahead of the Pacfic trough that's approaching. The trough approaches Arizona too quickly to allow Georgette remanants north into the state, and shunts the vorticity maximum of the old TS over toward El Paso by tomorrow morning (bottom panel is 500 mb NAM forecast from this morning for midnight tonight). It appears that forcing for vertical motion and heavy rainfall amounts will continue to focus over the RIM country northeast of Phoenix. The midnight run of the Atmo WRF-GFS does forecast a heavy swath of rainfall to extend from near sasabe north toward Payson - but this is hard to evaluate because of the "too wet" nature of that forecast run. An aside - the dewpoint temperature roller coaster ride continues out at Yuma. This morning the Td is down by 44F compared to 24-hours ago! So far, the big intrusion of mT air from south has not led to much precipitation, except probably in the Rim Country northeast of Phoenix. Here at house we had 0.20" during the night - this turns out to be one of the higher amounts at low elevations in the Tucson metro area. The ALERT network data indicate 32 of 93 stations with rainfall during past 24-hours, or about 34% areal coverage, (9 stations had had rainfall at 5 pm yesterday afternoon). Only one amount was greater than half an inch - Florida Canyon had 1.06" (with 1.02" of that in a downpour yesterday afternoon), which is far and away the highest amount I can find reported in a gauge early this morning. The RAWS observations indicated that 13 of the 15 working stations in southeast Arizona had measurable rainfall yesterday but amounts were light. The RAWS high elevation observations do indicate that, as radar loops tended to show, most afternoon storms yesterday tended to stay on the mountains. 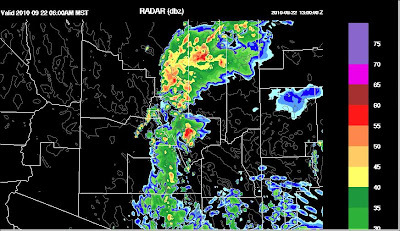 The top graphic shows the radar echo forecast from the midnight Atmo WRF-GFS for 6 am this morning, indicating heavy radar echoes east and northeast of Phoenix. 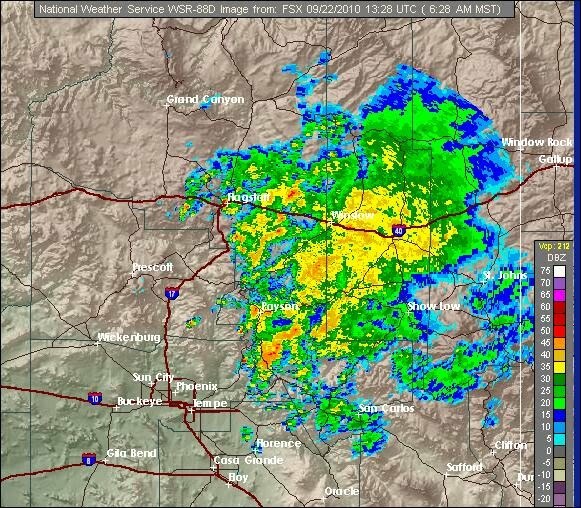 The bottom image is Flagstaff radar composite data a bit past 6 am this morning. The radar data indicate that the forecast precipitation area by the WRF was quite good, but that intensity tended to be too high [i.e., the convective component of the rain predicted was too intense, making the WRF-GFS too wet wrt total rainfall amounts (this has been the case recently)]. Top image is a heavy storm south of Kitt Peak around 4 pm today (21 Setember 2010), while middle image shows a storm building over the Catalinas about the same time. Thought you'd appreciate seeing this plot of 24hr Dewpoint Change over the Southwest. Certainly a nice surge... enough to get friends in Yuma complaining this morning. I told them to head to the beach to cool off. Puerto Penasco (Rocky Point) currently 90/66, SSW wind 25 mph, gusting to 30. Not pleasant! Increasing PW here has lead to some heavy rainfall. That first trough kept some small lines of storms going through last night... instantaneous rainfall rates up to 2"/hr in Silver City... and a lot of 1-1.50" reports up that way. Mostly 0.5-1.00" in Las Cruces... and 0.13" at my house in Santa Teresa. Also had a gauge near Cloudcroft in the Sacramento mountains pick up 1.10 inches this afternoon, most of which fell within an hour. Ridge axis is overhead here... very little steering flow to work with. Wednesday looks especially interesting! Plenty of moisture at all levels to our south and southwest. PWs approaching 1.70 inches? How Much Rain In September? How much rainfall many locations, such as here at the house, in Arizona have for September will depend on how things evolve between Tropical Storm Georgette and the approaching Pacific trough. Georgette (top IR image) was spinning away yesterday, and was officially named early this morning. She is forecast to move north up the GoC while weakening into a remnant. This morning (Tuesday, September 21st) finds southern Arizona having PW of 1 1/4 to 1 1/2 inches, with the very deep moisture lurking north of Guaymas. The morning Tucson sounding (middle graphic) indicates a bit more CAPE than yesterday but still with two flow regimes - baroclinic westerlies ahead of the Pacific trough overlie light winds in the moist lower troposphere below 500 mb. No good steering flow yet and and a warm upper-troposphere remaining hostile to deep convection. Both the midnight WRF run and this morning's NAM run forecast convection this afternoon and evening to again remain mostly on the higher terrain (see previous post). However, the models forecast deep tropposperic southerly flow to develop during the night and to persist 12-hours or so, before the Pacific trough sweeps by. It is during this period that the models forecast a very significant precipitation event for much of Arizona. Both the WRF and NAM forecast an early am rainfall burst between midnight and sunrise tomorrow (see NAM 6-hour rainfall ending at 5 am bottom graphic). The WRF nocturnal event is forecast to be centered further east by about 60 to 100 miles. It will be interesting to see how the morning Atmo WRF runs develop the precipitation event! Regardless, an interesting weather event unfolds after a long, hot, dry spell! Yesterday (Monday 20 September 2010) thunderstorms stayed mostly on higher terraing from the southwest to south to northeast of the Tucson metro area. Nogales had a strong outflow from the south and then thunderstorms with 0.32". 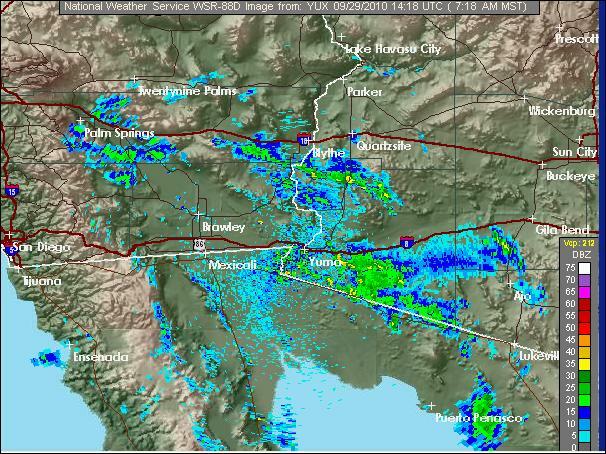 Two stations in the ALERT network had rain down toward Nogales, with Tubac reporting 0.67". A large outflow passed TUS right before 7 pm (see top graphic) with a temperature drop of about 15F and a dewpoint rise of about 20F. This outflow helped push low-level moist air back into much of southeast Arizona as winds gusted 30 to 40+ mph from the south. 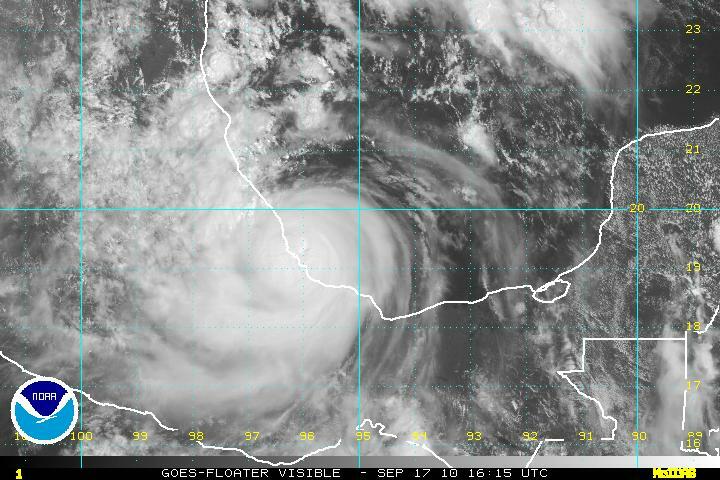 It is likely that the large outflow had its origins with the large MCS in northern Sonora that had redeveloped to the north several times during the day (see 00 UTC IR image middle), with re-enforcement from the storms that developed as the outflow moved across the border. The bottom plot shows surface observations at 9 pm. 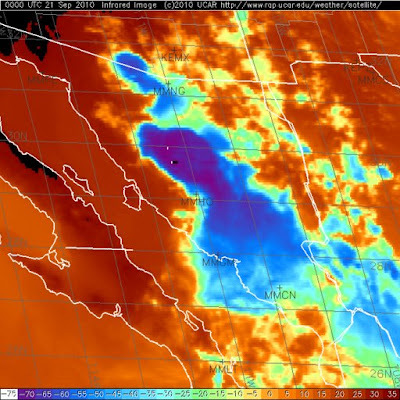 The outflow covered southeastern Arizona, while air with Tds in the 50s was moving back into southwest and south-central Arizona as a precursor to a significant Gulf surge. 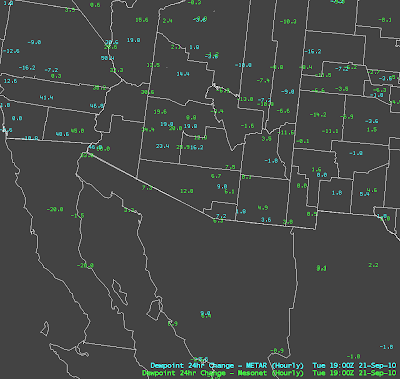 The dewpoint at Yuma this morning is 37F higher than it was 24-hours ago - quite an amazing change! 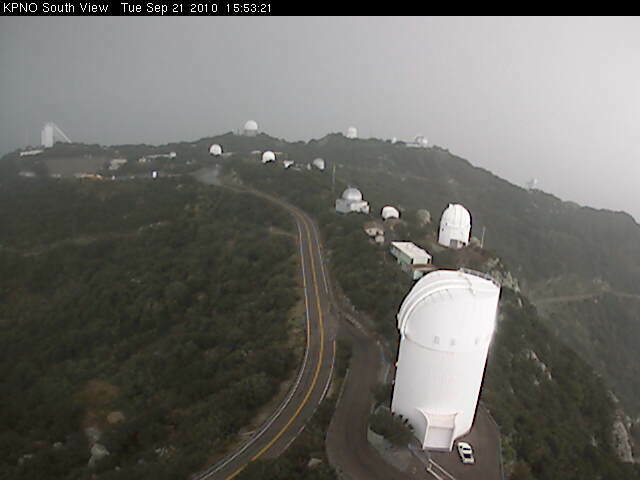 Very nice sunrise this morning (top) with light showers over the eastern Catalinas - couple of stations up there have had one to two tenths of an inch of rain this morning. Focus in this post will be on today - although, both the Atmo WRF runs and NAM indicate a substantial rainfall event by Wednesday evening - the WRF is more widespread in its forecast; whereas, the NAM focus is on the northern mountains of Arizona. For today, the Univ. of Arizona, Atmo. Dept. variant of the WRF (run at 06Z last night) continues to forecast an active afternoon for southeast Arizona (WRF radar reflectivity at 2 pm is shown in middle graphic). The model forecasts storms to occur in lower elevations, as well as the mountains. However, I suspect that the model did not properly forecast the warm advection that occurred overnight at and above 500 mb. This morning's sounding (bottom from SPC) shows that the atmosphere below 500 mb has continued to moisten and PW is approaching an inch and a half. Winds above 500 mb are Pacific westerlies, while winds below are southerly with a fetch from the subtropics. As the trough sharpens along the Pacific coast the next two days, the models forecast a strong northward intrusion of mT air. The trough in the westerlies is forecast to phase nicely with an inverted trough that is currently over the lower GoC. The morning sounding does indicate weak westerly steering flow today and CAPE is quite limited due to the very warm above 500 mb - sound familiar? So, we'll have to watch to see if the model predicted CAPE develops, or if it is diminished by the morning WRF runs with the new observational data. Edited to add additional info on the WRF forecast from Mike Leuthold. Besides the forecast of a few showers, I wanted to point out that the forecast lows from the WRF yesterday for this morning (Sunday) were excellent as it had the strong morning easterly winds forecast correctly, plus an increase of moisture which lead to a forecast low of 80F. UofA low was 79.3. The Univ. of Arizona, Atmospheric Sciences Dept., high-resolution WRF-GFS forecasts from the 0600 UTC runs last night are quite interesting. 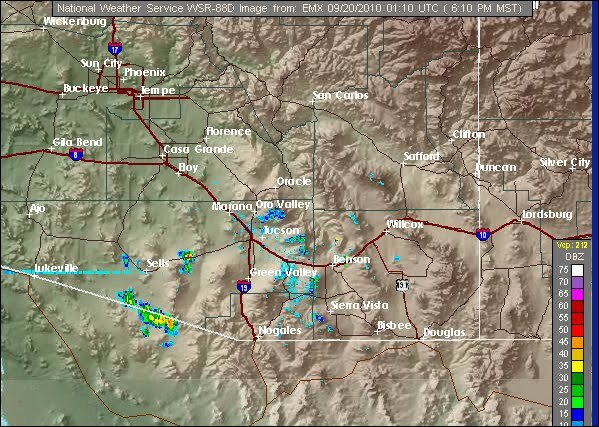 The forecast for late this afternoon indicates isolated showers and thunderstorms developing along the border and then extending northward into Santa Cruz and central Pima county. 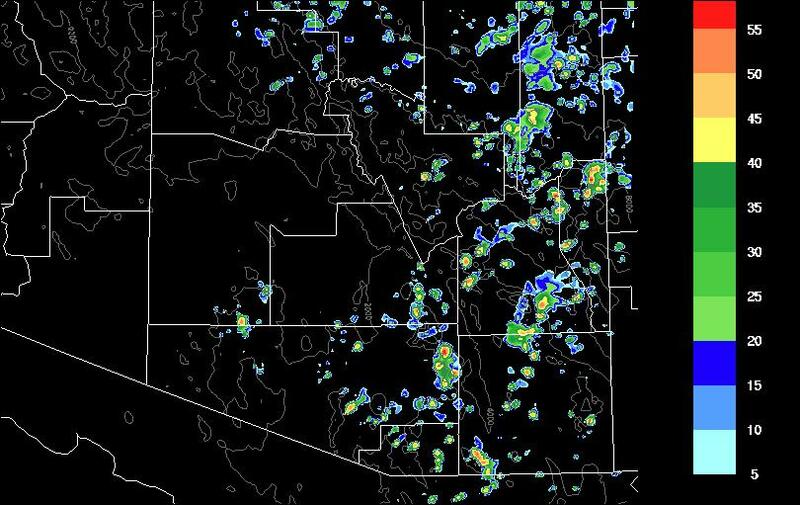 The composite radar image above shows some radar echoes in central Pima County a bit after 6pm on Sunday afternoon. 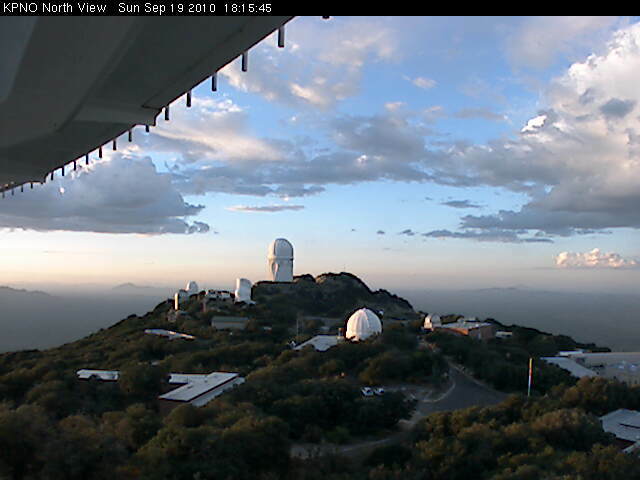 The photo is looking north from Kitt Peak about the same time. OF THESE SHOWERS AND THUNDERSTORMS WILL BE TO THE WEST AT 10 MPH. The top graphic shows the WRF prediction of composite radar at 3 pm Monday afternoon and the bottom graphic shows the same for 3 pm Tuesday afternoon. So, the WRF model predicts scattered showers and some thunderstorms for most of the eastern half of Arizona both tomorrow and Tuesday. So the start of the new week will be considerable more interesting than was the start of last week. Low-level moisture is slowly on the increase over southeastern Arizona, as forecast by yesterday's Atmo runs of the WRF model. The top image shows this morning's Tucson sounding with PW of almost an inch, and perhaps even a tiny bit of CAPE by afternoon. Winds are easterly from the surface to above 500 mb, with some speeds near 20 kt. Thus, a nice vertical wind- shear profile. The middle graphic is this morning's 500 mb chart from NCAR RAP. Note that the subtropical anticyclone has shifted well to the north, and that there is a very large inverted trough extending south from near El Paso into the Tropics. The NAM model indicates the possiblity of a tropical disturbance spinning up south of Baja during the next 48-hours or so. 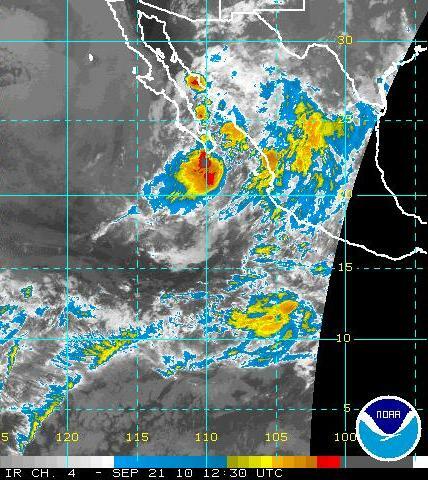 And the bottom image shows a large area of disturbed weather and thunderstorms off of all of southwestern Mexico. The big question over the first half of the new week will be how the Pacific troughiness in the westerlies will phase/interact with events at low latitudes. It appears possible that a low-level surge of mT air will develop by Tuesday-Wednesday, as deeper moisture also increases from the southeast. The Sunday morning newspaper forecast banner today, from Jimmy Stewart and KOVA, indicates zero per cent chance of rain for the Tucson area today, Monday and Tuesday. I'll post WRF forecasts in next, showing what a risky (or brave) forecast this is. It is extremely dry and clear over Arizona this morning - see top visible satellite image from this morning. But there is a Pacific trough off to the northwest and a large, subtropical inverted trough (to the far southeast) to the north of what was Hurricane Karl. These two features will clash a bit over southeast Arizona tomorrow afternoon and Monday (September 19th and 20th). The Univ. of Arizona, Atmospheric Sciences version of the WRF-GFS model - the run from midnight last night - forecasts increasing dewpoints at 850 mb from the east and east-southeast tomorrow and Monday. The moisture increases enough that the model forecasts some isolated showers tomorrow. 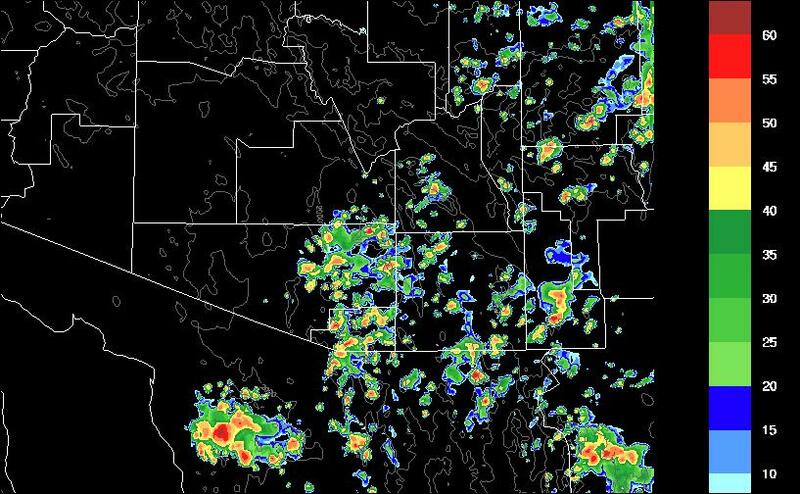 The model-forecasted radar reflectivity for 2 pm on Monday (middle panel) indicates scattered showers and a few thunderstorms over much of eastern Arizona as the Pacific trough approaches. This morning's NAM forecast run also picks up on this trend and forecasts an area of light rainfall over southeast Arizona for the 12-hours ending at midnight Monday night. The NAM doesn't seem to have as much activity as the WRF forecasts. Nothing to write home about, but at least a bit of weather to keep an eye on. 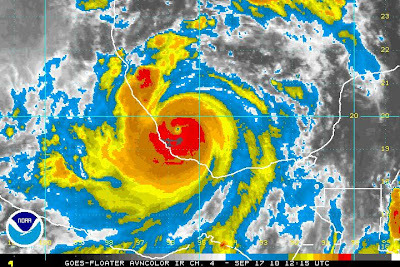 Hurricane Karl intensified to a Cat 3 storm and is apparently going ashore near Vera Cruz, Mexico at this time. Karl seems to have turned toward the southwest and it remains to be seen how and where its remnants will come out into the Pacific. It's not clear whether the remnants will be far enough north to trigger a moisture push up the GoC. We'll just have to watch. Yesterday's WRF early run forecast a bit of an uptick over toward the New Mexico border for this afternoon. However, this morning's runs, with low PW values over almost all of the southeast part of state, aren't forecasting very much today - WRF-NAM forecasts a few weak showers over the White Mountains; the WRF-GFS forecast indicates isolated thundershowers in Cochise County. So the great influx of Iowa Hawkeye fans are not dragging any humidity along with them - they'll find Tucson very desert-like this weekend. Not much changing. Last three days Tucson has had a high temperature of 100F. Low level moisture has increased very slightly and lows have stayed up in 60s here at house. This morning's (Thursday September 16) Tucson sounding has come in with data that are too moist by 4 to 5 mm when compared to the GPS PW. The data plot seems to indicate that the humidity sensor was responding slowly to changing RH and damping down the actual trends. This morning's 0600 UTC run of the Atmo WRF-GFS model indicates a slight uptick in thunderstorm activity to the east of Tucson tomorrow. The model forecasts a brief increase of low-level moisture coming in from the east (top image is 850 mb Td at noon tomorrow). This leads to some increase in storm activity off to the east (middle image is model-simulated composite radar reflectivity at 2 pm tomorrow). Bottom image shows that TS Karl is now over the Bay of Campeche. 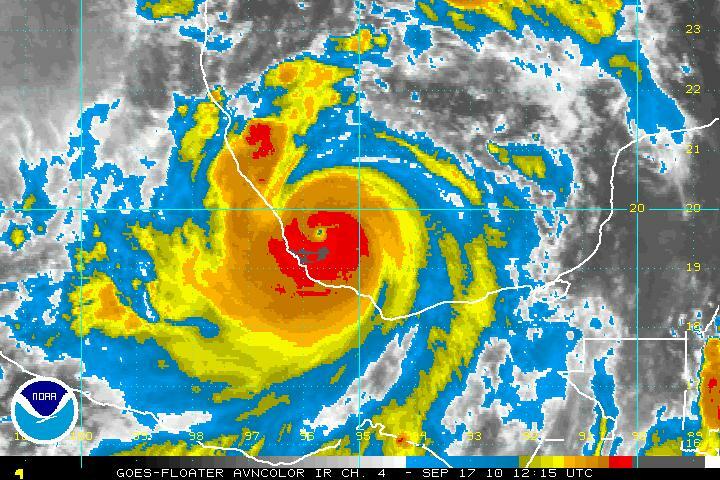 Karl is forecast to become a hurricane before making landfall on the Mexican coast. The ECMWF continues to forecast the remnants of Karl to move westward over the mouth of the GoC early next week.